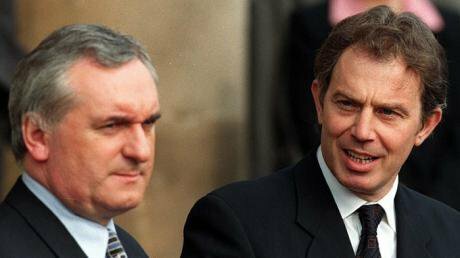 Image: British and Irish premiers Bertie Ahern and Tony Blair, who signed the Good Friday Agreement. As former Ulster Unionist party leader David Trimble liked to say, “fine words butter no parsnips”. But, on April 10 1998, Trimble signed up to a text that positively fizzes with elegant phrases and noble sentiments. Reading the Good Friday Agreement’s irenic first page today feels like peering into another political age, one peppered with hopeful talk of “reconciliation, tolerance, and mutual trust” and “the vindication of the human rights of all”. In many crucial respects, the optimism of the signatories in Belfast that cold April day has been borne out. During the three decades of the Troubles, more than 3,000 people were killed. In the years since the Good Friday Agreement, political violence has become the exception not the norm. And yet the Agreement celebrates its china anniversary in an uncertain place. Power-sharing in Belfast has collapsed, with no prospect of a swift return. Rather than trumpet a peace deal that has become a model for others around the world, senior members of the UK government blithely declare that the 1998 accord has “outlived its use”. A Labour shadow cabinet member recently called the Agreement a “shibboleth” that was being “played up” during Brexit negotiations. Such views are not universal in Westminster but they reflect a general disengagement in Northern Irish affairs by London – and Dublin – since 1998. With no more videos of exploding bombs on the ten o’clock news there was no need to speak of ‘the province’ again in anything but the most superficial of tones. When, in 2012, riots over the flying (or not) of the Union flag from public buildings crippled Northern Ireland, then prime minister David Cameron did not deign to visit. Nobody was dying. Brexit has returned Northern Ireland to British political debate, albeit frequently in a nakedly instrumental fashion. Brexiters dismiss the Irish border as a mere bagatelle soluble by wit, creativity and a dash of technology. A frankly shocking 81 per cent of English Leave voters tell pollsters that destabilishing the Northern Irish peace process is a price worth paying for Brexit. Meanwhile, some remainers cling to Good Friday as a political deus ex machina - “The Agreement will stop Brexit!” – but often show little appreciation for the complexities of Irish politics. Northern Ireland’s difficulties cannot be blamed solely on the vote to leave the European Union. The gulf in trust between nationalism and unionism is arguably as wide as during the Troubles. “At the time the Agreement was signed there was a lot of euphoria. There was a generosity of spirit but within the last five years a lot of that has disappeared. There is a different mind-set in the two communities now,” a former loyalist prisoner told me in Belfast recently. My first ever ‘adult’ job was in what was disparagingly called ‘Northern Ireland’s peace and reconciliation industry’. It was spring 2008 - a few weeks before the tenth anniversary of the Agreement. I was to assist republican and loyalist communities on either side of a sectarian interface in Derry to ‘reimagine’ a future without the ten foot high wall that separated them. The project was funded by the European Union. At the end of six months, I wrote a report. The wall is still there, as are dozens across Northern Ireland. This was not the plan. The Agreement is based on a remarkably open vision of identity. Everyone in Northern Ireland can chose to be British, Irish or both. The Manichean dichotomy of green and orange would, over time, be replaced by a genuine pluralism. But, as some warned back in 1998 and since, a peace deal predicated on giving power to ethno-national blocs produced a politics dominated by the most hard-line parties. Trimble’s Ulster Unionists and John Hume’s SDLP – key architects of the agreement – are now marginal figures often written out of a politics dominated by Sinn Fein and the DUP (the only major Northern Irish party to oppose the agreement). Far from drawing a line under the past, post-Agreement Northern Ireland can feel almost engulfed by what happened during the conflict. There is no agreed narrative of the past – an impossibility, surely – but there is no agreement to disagree either. Radio phone in shows and TV debates remain dominated by who did what to whom. “After the peace agreement it should have been about looking after those most affected and moving on. But the politics has been driven by the argument over the morality of the Troubles,” says victims campaigner Paul Gallagher. Gallagher was just twenty-one when loyalist gunmen called at his family home in nationalist West Belfast. He was shot six times. “I was told ‘you’ll never walk again.’ That was possibly harder than being shot”, he said. Gallagher has spent years campaigning for pensions for those permanently disabled during the Troubles. Legislation was passed to grant victims pensions but has been blocked by the DUP and others in a row over the definition of victims that includes a tiny number of former paramilitaries. As a consequence, around 500 victims are still without a pension. The Good Friday Agreement set out rules for how Northern Ireland was to be governed. But the 35-page text was largely silent on how to deal with the legacy of the Troubles. There were fine words about reconciliation, but there was no action. Successive Sinn Fein-DUP administrations deracinated what was intended to be the framework policy for addressing community divisions and sectarianism. The most recent talks broke down in part over so-called legacy issues. Twenty years on from the Agreement, Northern Ireland has no effective plans for how to improve communal relations or increase integrated education. There is little sign of a return to widespread violence in Northern Ireland but some former combatants are frustrated by the reality of life after the Troubles. “Violence is still happening but it’s the violence of poverty,” says former IRA prisoner Robert Henry. Austerity hit Northern Ireland particularly hard. Even though the Agreement’s first decade was marked by seemingly constant political crises – the devolved government only sat for a couple of years all told – there was a significant increase in public spending, and a general air of optimism. Cranes littered the Belfast skyline. Now, Northern Ireland feels as if it is struggling to stand still. With the lowest levels of disposable incomes in the UK, there is no more talk of a ‘peace dividend’. Suicide rates are higher than in England, Scotland or Wales, and more people have killed themselves since the Troubles than died violent deaths during them. The Executive has often been beset by the worst pork barrel politics. It collapsed following a scandal over a botched renewable heating scheme that saw businesses paid hundreds of millions to burn wood pellets. The Agreement scarcely altered Belfast’s sectarian geography. Kerbstones are still painted in national colours. Some of the tattered flags that fly from lampposts look as if they have not been replaced since 1998. The same neighbourhoods that produced many of the combatants in the conflict are among the UK’s most deprived. A few weeks ago, I took a walk through West Belfast, from the republican Falls to the loyalist Shankill. Both sides of the ‘peaceline’ were blighted by urban decay and empty units. The Northern Ireland Executive has said that all interface barriers will be removed in the next five years, a fatuous promise that nobody believes will be realised. “There’s no plan. Nothing,” an architect friend in Belfast told me. His firm has spent 18 months attempting to broker the opening of a single gate at one of Belfast’s less controversial interfaces. The Good Friday Agreement remains a remarkable document worthy of celebration. The British constitution was fundamentally changed – Northern Ireland, effectively, has the right to secede - and without most of Britain realising it. The European Union was a vital underpinning: an entire section of the text, Strand Two, is dedicated to north-south institutions and co-operation only made possible by the absence of a border. But reading the Agreement again today it is hard to feel that the spirit of inclusiveness has survived the intervening decades. The same David Trimble that bravely led Ulster Unionism into accommodation with Irish nationalism now issues wild warnings about loyalist violence if Northern Ireland remains in the customs union after Brexit. Such talk brings back the ‘us’ and ‘them’ that the Agreement’s complex architecture was designed to ameliorate. Brexit begs questions about a united Ireland, too. The next census will confirm that Northern Ireland is a minority-minority society. The Northern Irish peace process would probably never have happened without two factors: international interest and domestic political bravery. The former is strikingly absent, especially from London. And with the DUP propping up the Conservative government and Sinn Fein polling record numbers after collapsing the Assembly, there seems little political impetus for the thing that made the Agreement possible -- compromise. 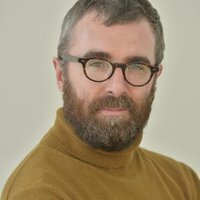 Peter Geoghegan will be appearing as part on a discussion entitled On Brexit and The Belfast Agreement with journalist Lesley Riddoch and poet Robert Crawford in conversation with poet and essayist Chris Agee at City Halls, Glasgow at 8pm on April 10 as part of the Crossways Festival.